A couple weeks ago we went to see Kubo and the Two Strings, the latest work from Laika studios. It was our treat for our kiddo's birthdays but really a treat for all of us. 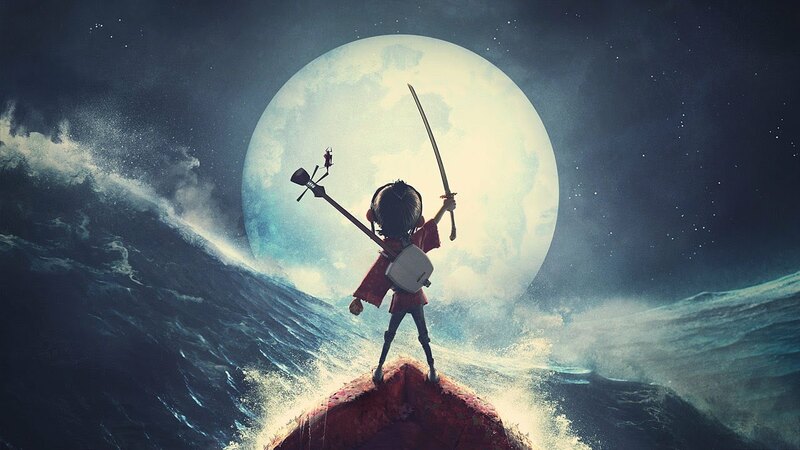 Already fans of their work on Coraline and The Box Trolls, we had heard great things about Kubo and the Two Strings but hadn't managed to get out and see it. Being so late in it's theater run, the closest showing was almost a two hour drive, but we made it anyway. After seeing the movie, I would make the drive a thousand more times if it meant being able to see such a beautiful film again and again. LSadly, by now it is probably too late for you to see Kubo and the Two Strings at your local theater if you haven't already. Like every one of Laika's films, it is a delightfully original story in a sea of re-hashes and remakes. If you are able to see it at all, I strongly recommend you do so, posthaste. It is often easy to forget that Laika's films are all stop-motion features. Each frame of their films is created by hand, with actual models. It is a painstaking process that requires an enormous commitment and attention to miniscule detail. Before digital effects came to be, stop motion was everywhere. Those were the days of Ray Harryhausen, a legend in the industry and a pioneer of stop motion and miniature effects. It was his work on Jason and The Argonauts that first got me interested in stop motion. What Laika makes today is largely still handled the same way, even though some of the technology has changed. Kubo and the Two Strings is immediately beautiful to behold. The art style and character design is just incredible. I went into the story largely blind, as I think you should as well, but I can mention a few facets of the film's structure without giving too much away. Kubo is a boy who lives in a small village where he tells stories of a legendary samurai to the other villagers. At his mother's instruction, he is not allowed to stay out past sundown, and must race home every day before if disappears behind the horizon. What happens from there I won't mention, but it is worth the wait. At once an adventure story and a coming of age tale, Kubo and the Two Strings manages to give its younger audience quite a bit of credit. It is a film that deals with complex subjects like separation and death, things that are normally taboo (at least in part) in children's films. The maturity and confidence with which Kubo and the Two Strings tells it's story is something that I find very commendable. As has often been the case with Laika's films, there is a distinctly dark aspect to the feature's tone, but one that is tempered with such heart and sincerity that is wholly another creature apart from anything Laika has produced so far. It baffles me that Kubo and the Two Strings has performed so poorly at the box office. Suicide Squad, arguably one of the worst films I have seen all year, managed to beat Kubo in it's opening weekend, pushing the brilliant film to fourth in the box office. If you are able at all, please go see Kubo and the Two Strings. It is an absolutely breathtaking experience that you won't regret taking the time to see.